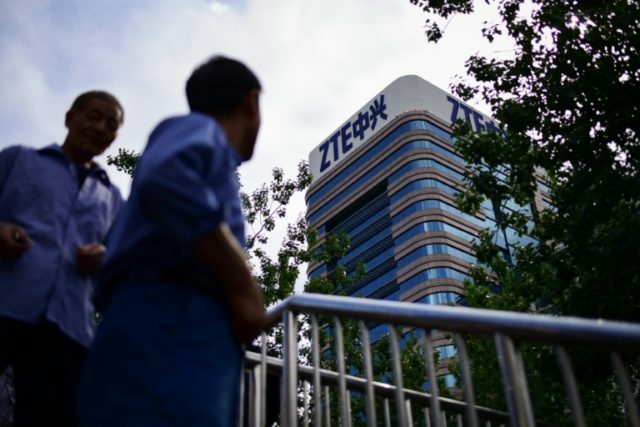 Shanghai (AFP) – China’s ZTE has pledged to dish out internal punishments and address flaws in its corporate culture after Washington and Beijing reached a deal to ease sanctions that had pushed the telecoms equipment maker to the brink of collapse. Washington in April banned the sale of crucial US components to ZTE for seven years after finding it had failed to take action against staff who were responsible for violating trade sanctions against Iran and North Korea. In a memo to employees seen by Bloomberg News, Chairman Yin Yimin promised to hold “relevant people” accountable for the episode and said ZTE would restart idled production lines soon. “We must deeply realise that this issue in essence mirrored problems in our compliance culture and management,” Yin’s memo said, according to Bloomberg. Under the deal announced Thursday by US Commerce Secretary Wilbur Ross, ZTE will pay a $1 billion penalty and put another $400 million in escrow to cover possible future violations. ZTE, which is based in the southern city of Shenzhen, will also be required to change its entire board of directors and hire outside legal compliance specialists who will report to the Commerce Department for 10 years. In return, Washington will strike the company from a sanctions list. The company was fined $1.2 billion last year for the initial sanctions violations. The ZTE saga has been a key bone of contention in the tussle between the world’s two biggest economies over trade policy and sensitive technologies. The settlement comes just days after Beijing reportedly offered to ramp up purchases of American goods to help cut its yawning trade imbalance with the United States — moving part-way towards meeting a major demand of US President Donald Trump. China’s foreign ministry on Friday offered a muted response to the ZTE deal, but a spokeswoman added “we also hope the US can provide a fair, equal and friendly atmosphere for Chinese enterprises’ investments and operations there”.